"Dandini Puppets present enough to fire the imagination of the very young but seems to have plenty for the Mums and Dads here and looks like a terrific working act "- Mark Ritchie, THE STAGE. "The Dandini Puppets has long been among the market leaders in its field and on this showing it was not too difficult to see why" - Mark Ritchie, THE STAGE. 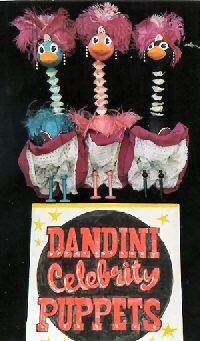 The Dandini Puppets have had vast experience in holiday centres since they first produced their Puppet Cabaret Show for Haven Holidays, a show which toured their centres throught the country. There followed an eight year run at Centre Parks UK. The new Dandini Celebrity Puppets have been named the market leaders in this field. 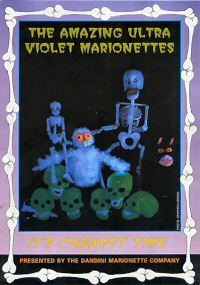 The puppets are splendid likenesses to the stars they represent, with up to date characters and also featuring UV effects. The show normally ends with an Ultra Violet Finale. The Celebrity Puppets can also be used in Shopping Centres.